Hello lovely readers! I remember reading an article ages ago written by a lady who wrote what she wishes women's magazines would write about. For the most part I agreed with her I used love reading women's magazines but I grew so frustrated with them, they are patronising, hypocritical (e.g. telling us to love and accept yourself then telling us how to look like some celebrity in two weeks) and repetitive. So today I'm going to be sharing three articles which I wish women's magazines would write and three I wish they wouldn't. Yes, I know what you must be thinking, "Ella, women's magazines are filled with relationship advice".Let me explain, I wish magazines included advice from couples who have been in a relationship for forty years, instead of so called relationship "experts". I would love to read advice from couples who have been together for a really long time and have been through ups and downs together. It would be so interesting if women's magazines would write articles about new bands or musicians who may not produce "mainstream" music. Note: I'm not someone who hates something just because it's mainstream. It would just make a great change to read about different types of musicians. Again, I know that magazines often write about body image issues however these are often limited. People have other issues with their bodies then just "I'm too fat" or "I'm too thin", I once knew a girl who hated her arms because she thought they were too long. Magazines should acknowledge that there are lots of different types of body image issues and should write articles which help people with their body confidence no matter what there body issue may be. I really can't stand articles like this or ones that tell you how to dress for your body shape. If you like something and it's comfortable, you should wear it no matter what your body shape may be. Magazines shouldn't make people even more self-conscious about their body by telling them to cover it up. Let me be clear, I don't mind when magazines write exercise or diet tips, they can come in handy as not everyone wants to exercise or eat healthier just to lose weight but to look after themselves. What makes me angry is when magazines write articles which encourage weight loss at an unhealthy rate. Seriously. Not. Cool. Or any similar article. Objectification and sexism work both ways, you cannot claim that things like Page 3 are sexist and objectifying and not claim that articles that show half naked men which judge them by their body isn't. I hope you enjoyed reading about what I wish women's magazines would/wouldn't write about. Do you agree with an y of these? What do you wish women's magazines would/wouldn't write about? Thank you so much Kim you're so sweet! It's the same with me my weight is only one of my body issues. I'm so pleased you enjoyed it my lovely friend thank you for your lovely comments they always make me smile! I hope you are having a great week so far! Aw I love Kim, I'm so pleased you found my blog through her! Yes I totally agree with you there is a lot of quality content that could be published but is ignored, it's such a shame! Thank you so much I'm glad you like my blog, thanks for popping in! This was a great article! 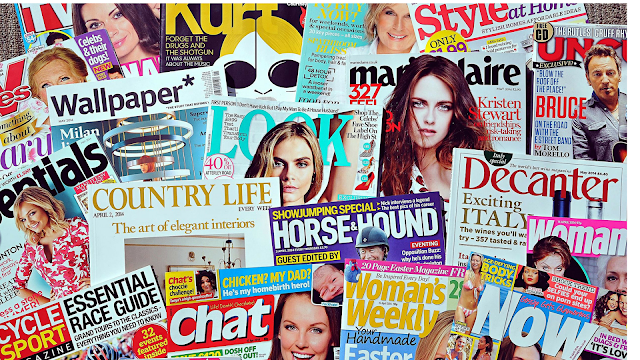 I feel that magazines like that start loosing they appeal and blogs start to gain more readership - because we are honest, but magazines are kinda sketchy. Thank you, I'm glad you enjoyed it! I agree, I much prefer reading blogs because I know I'll get honest advice. Thank you for stopping by!